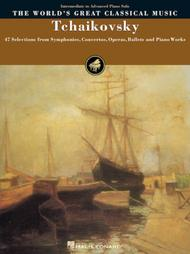 Barcarolle in G Minor (June), Op. 37, No. 6, from "The Seasons"
Chanson triste, from "Douze Morceau"
Melodie, from "Souvenir d'un lieu cher"
Romeo and Juliet, "Love Theme"
This book has all of the Tchaikovsky you ever wanted or need! My favorites are the Waltz of the Flowers and the Sleeping Beauty Waltz. A joy to play and for one of intermediate ability captures the romantic essence of Tchaikovsky and inspires one to go forward into all of his music. 34 of 56 people found this review helpful.